It’s almost too drearily, predictably inane a comment to warrant analysis. But one of Abbott’s skills, I now realise, is his soul-crushing dreariness, the effect of which is perhaps to make his opponents give up out of sheer mind-numbing boredom. He’s even worse when you actually listen to him — I can feel the long seconds of my life slipping away during the exaggerated “ah”s and “um”s that litter his speech, pointlessly punctuating a collection of words that are already drawn out and so devoid of substance that they may as well have been randomly generated. That is, by an “Ab-Bot”, if you will1. Isn’t it a bit patronising to start calling the carbon tax “anti-WA”, when the fight has always been a national one? Presumably, had the AEC lost 1,375 ballot papers in Victoria instead, Abbott would now masterfully be describing the carbon tax as “anti-Victoria”. Isn’t it a bit condescending to be attacking the carbon and mining taxes without even trying to offer an argument? He has in the past, of course, but since we’re still having this fight, are we fighting over ideas, or are we now just being assaulted by keywords intended to make us go crazy? And I always think we let off politicians and commentators rather lightly for their liberal use of the “anti-” prefix. For something to be “anti-WA”, it should in principle constitute a direct existential threat to the state — an issue that brings into question the very survival of Western Australia. But while my last power bill included an estimated “carbon component” of $14.282, I can assure all concerned that I am not, in fact, teetering on the edge of oblivion. We’ve all faced down greater threats to our existence than that. One of the threats we continue to face, it bears repeating ad nauseam, is climate change itself. The debate over the carbon tax, or rather carbon pricing generally, is lost if we forget why it was implemented in the first place. And no, it won’t instantly make climate change go away — it’s part of a very long term struggle to mitigate the damage we’re doing as a global civilisation. Nonetheless, seen in that light, a few dollars on your fossil fuel power bill, to encourage renewable energy, is not a great deal to ask. That’s the argument that needs to be made, because it’s the truth. But it’s too risky a strategy, Abbott must think, to inject actual information or reasoning into anything he says. He’s not stupid himself, but he seems to think (or perhaps he knows) that treating us like idiots is his best chance. I have a theory (or, really, two theories) about what goes through Tony Abbott’s mind in situations like this. The context, so as not to get too far ahead of myself, is that Indonesian doctors appear to be treating burns of asylum seekers who claim mistreatment at the hands of the Australian Navy, as they were turned around mid-voyage. Scott Morrison quickly pronounced this to be “sledging” with “unsubstantiated claims”. This is the political, amoral intellect of Morrison at work: conflating “unsubstantiated” with “incorrect”. Morrison’s own say-nothing policy must contribute greatly to the difficulty of determining the truth, one way or another, of such a claim. It can hardly have been “sledging” if, hypothetically, it turns out to have been accurate. However, Tony Abbott has since backed up Morrison by also pointing to the lack of evidence. But absence of evidence is not evidence of absence. We might ask what sort of evidence Morrison and Abbott would expect. These events took place at sea, where (I presume) the only witnesses were the asylum seekers themselves and navy personnel. Clearly the asylum seekers’ claims don’t count as evidence in the eyes of Morrison and Abbott, and we don’t have access to any information from the navy’s perspective. Morrison and Abbott expect the media to carry the entire burden of proof for something only the government (for now, anyway) has any real information about. Who do you believe? Do you believe Australian naval personnel or do you believe people who were attempting to break Australian law? Who do I believe? For a start, I’m disinclined to believe a man, Prime Minister or not, who frames the vulnerable and dispossessed as criminals1. What kind of moral compass can such a man possibly have? I’m also disinclined to believe a man who asks us to simply ignore serious allegations in lieu of spending a modicum of time and effort investigating them. We don’t have to just “believe” one side or the other. A little transparency is not too much to ask in a democracy, surely. Of course, it’s problematic to accuse unspecified defence force personnel of abusing asylum seekers, because these are people to whom we feel collectively indebted for the personal risks they take on our behalf. But they are not superhuman, and it is not actually that hard to believe that abuses might have occurred. These are human beings in relatively isolated, probably very stressful situations, acting in the context of a brutal government policy. And there are unfortunate precedents for abuse within Defence and within our police forces. People in authority are not always flawless. One pressing political question is this: how would Morrison and Abbott react if the media now does uncover more substantive evidence of abuse? Whether or not Morrison and Abbott intend it, turning on the outrage early in a debate seems to cement the debate in place. If you tried this, you might worry about looking like a fool, especially if evidence is later uncovered that undermines your position. But in politics, perhaps, the early-outrage strategy actually creates a certain imperviousness to future revelations. If you’re a high-profile person, and you can articulate a hard-line position, you can make a lot of other people very angry in sympathy with you, and angry people have a habit of not quite thinking things through. Angry people treat new information not as information, but as ammunition, either fired at them by the enemy2, or available for them to fire back. In this view of the world, you never make mistakes, never need to issue an apology and never need to readjust your thinking. Even in the face of hard evidence of abuse (again, hypothetically), a political leader with sufficient willpower, and a sufficiently faulty moral compass, can plough straight through, with the ironclad support of people who worship strong leaders and who care more about political victories than about good policy outcomes. Of course, the other theory is that Morrison and Abbott are just flying by the seat of their pants, just saying whatever seems most expedient right now, with undiluted confidence in their ability to later dig themselves out of a great steaming pile of whatever they may now be getting themselves, their party and their country into. If this theory is correct, then there is at least hope that Morrison and Abbott may be inclined, after a bit of kicking and screaming, to do something about the excesses of the implementation of their policies. Morrison’s training for the immigration portfolio, I can’t help but noticing, has consisted of years in opposition of saying whatever seemed expedient (in the course of raising awareness of the horrifying menace of dispossessed people coming to our shores and asking for asylum). Abbott similarly veers so far from doing anything constructive (say, in the areas of fiscal management, environmentalism, public transport and education, to name a few), that it’s hard to tell if he’s actively trying to be an arseclown, or if he’s just never worked out how (or even why) not to be one3. At some point, he’s probably been told to just keep doing what he’s doing and call it a strategy. There will certainly be a lot more arseclowning to be done before this issue is settled. Here’s the perspective of Michaela McGuire, who also considers the problems of the government’s no-inquiry position, and provides a few extra details. Here’s the ABC’s Fact Check unit explaining why Tony Abbott is factually incorrect to accuse asylum seekers of trying to break Australian law. The whole purpose of the carbon tax is to raise the price of power. If the price doesn’t go up, the carbon tax isn’t working. The point of the carbon tax is not to raise the price of power. That’s a lie, and a much more clear-cut lie than anything I’m aware of Julia Gillard saying on the subject. The point is to create a price differential between competing power generation technologies. The point (insofar as electricity is concerned) is to make non-polluting technologies cheaper than coal, oil and gas. All else being equal, we expect the overall price of electricity to rise — because to start with there will be very little renewable power generation — but that’s not the “purpose” of the tax. As the ABC article discusses, the overall price might actually go down for other reasons (network transmission efficiencies, in this case). If this happens, it would have no bearing on the functioning of the carbon tax at all, because the differential between fossil fuels and renewables would remain. All else being equal, when fossil fuel generation eventually ceases altogether, the price of electricity should return to its former level in real terms (edit: Okay, not really — this is technology-dependent). This kind of statement from Abbott is not merely an opinion, not merely misdirection, not merely an unsustainable or misguided promise (as in the case of Gillard). It is blatantly, unambiguously, factually incorrect, and Abbott himself cannot plausibly claim ignorance of his errors1. By now, everyone in federal politics must have a reasonable working understanding of carbon pricing, given how long and hard we’ve been talking about it. I don’t see, therefore, how Abbott’s remarks can escape even the narrowest definition of a lie. In a previous post, I described Labor as the “architects of unconscionable incompetence”, specifically with respect to the Malaysian Solution, at least temporarily defeated by the High Court. This post is motivated by the latest political manoeuvring on the issue. I was about to declare myself wrong over the “incompetence” tag (but certainly not the “unconscionable” tag). It occurred to me that perhaps Labor was playing a Machiavellian political game to ensure that the “boat people” moral dilemma went away for good. They would put up with whatever short-term political damage they might incur, on the basis that eventually the policy really would actually stop the boats. If anyone arriving by boat really was transported to a place as hostile to refugees as Malaysia, it can’t have been long before Bowen’s logic – “breaking the people smugglers’ business model” – was borne out. The original crimes – abandoning the most vulnerable to stop anyone else even trying to ask for help – would eventually be forgiven by an amnesic electorate too wrapped up in future political issues. If the boats stopped, then it would no longer be necessary to invoke the policy, and so it would become invisible. But no, not content to abandon human rights, Labor really does seem to have a political death wish. Once the High Court had made its ruling, it could have been foreseen that Abbott would block any attempt to change the law. He ostensibly wants to “stop the boats” too, and in that capacity the Government’s argument makes sense. Except that’s really not what he wants to do at all; at least, not until he becomes Prime Minister himself. As long as refugees continue to make the voyage from Indonesia to Australian waters, a disconcertingly large proportion of voters will continue to be outraged at the Government’s apparent inability to “protect our borders”, and will (by a trivial process of elimination) look to Abbott instead. Thus, for the moment, Abbott has a crucial political interest, perversely, in ensuring the boats do not stop. Abbott did not have any power to actually act in this interest until the High Court ruling (along with the Greens’ opposition to off-shore processing). Now that his support is needed, he can casually mull over the effectiveness of any Government proposal, and then vote perversely. The likelihood of Abbott supporting any change is inversely proportional to its likely effectiveness (and legal robustness), because that’s what maximises his political advantage. Bowen has attempted to call him out on this, but Abbott plays the rhetorical game much more skillfully. The Government was extraordinarily foolish to even attempt negotiations under these circumstances. Now, the Government has an untenable policy – both morally bankrupt and politically dead. If Labor had bitten the bullet and gone with the Left faction’s push for on-shore processing of asylum seekers, their policy would instead have been both (relatively) humane and politically viable. The issue would not have magically disappeared, of course – many “patriots” would continue be outraged at the thought of the hordes of persecuted foreigners being given safety and comfort. But what can be done about this? The issue will not disappear now no matter what the Government does. Meanwhile, Abbott is seizing the moral high ground (rhetorically, at least) on asylum seekers – something many Liberals have long given up on. His excuse for not supporting the Malaysian Solution is that there are insufficient protections for those sent there. This excuse has the advantage of actually being a perfectly valid reason. I continue to say “excuse” though, because I’ve seen too much political expediency from Abbott to have any faith in his adherence to actual principles. The Malaysian Solution would have been a masterstroke of Coalition genius if Abbott had thought of it. But that’s hypothetical, and not many people are likely to care. Abbott may yet “slip up” in a moment of uncharacteristic honesty, but I’m not counting on it. Indeed, I can only applaud his rejection of this particular policy, regardless of his actual reasons. I suspect the only way out for the Government is still to abandon off-shore processing, and live with the consequences. Of course, it may prefer its own approach of bludgeoning itself to death. There is a real risk that we are about to lose one of the key opportunities that Parliament has to hold the executive accountable and to ask ministers to think on their feet. What really is the fulcrum of Parliament, something the nation tunes in to every day and an opportunity to put ministers on the spot, runs the risk of descending into a scripted farce. At the moment we have the length of Question Time being determined by what time Play School comes on television. I can understand and sympathise with Bandt, but this strikes me as being a little naïve. 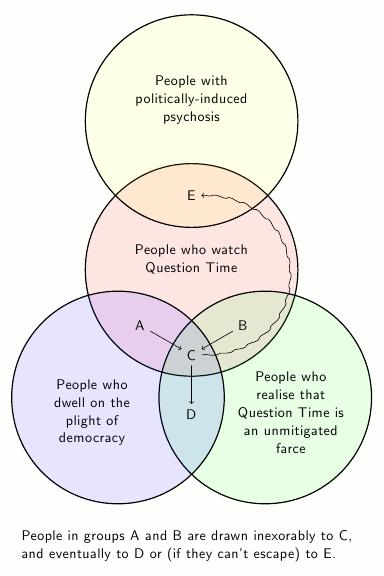 Question Time has almost never been anything but a farce. Each question from a Government MP is a blank cheque for the relevant minister to burble on about how great they are. Each question from the Opposition is just a rhetorical salvo designed to damage the government’s credibility. It’s been like that since the dawn of time, and our adversarial, two-party system almost guarantees it will stay that way. Independent MPs – including, presumably, Mr Bandt himself – are the only ones even remotely likely to use Question Time as a means of acquiring information and so informing the public. However, they get very few opportunities to do so, and such cool-headed rational discourse appears not to rate very highly in media coverage. If we can make Question Time not an unmitigated farce (or we can get rid of people likely to care about democracy), then we can worry about Abbott’s choreography. By putting in place this new body, this new bureaucracy to oversee the flood and the storm spending, they have accepted that the public don’t believe they can be trusted with money. You should not need a second bureaucracy to ensure that the first bureaucracy spends money wisely. Of course, Iron Man Abbott would conduct the entire reconstruction single-handedly, crafting thatched roofs from torn up NBN fibre. After all, we apparently don’t need him in his current role as Leader of the Second Bureaucracy. Isn’t that what the Opposition is for, after all? Speaking of which, there is a reason Gillard is Leader of the First Bureaucracy, instead of Abbott, and it might have something to do with being “trusted with money”; specifically, $11 billion of it that didn’t really exist. If Abbott had been in power we might have needed a Third Bureaucracy to keep things in check, in case the Second Bureaucracy died from sheer exhaustion. This is the flood tax intended to pay for the rebuilding of Queensland’s public infrastructure, and the sentence appeared in an email sent by Tony Abbott. I know it’s your job to oppose things Tony, but for the time being could you possibly focus your fundraising efforts on the unfolding disaster itself and not on your own political career? Oh good, so it wasn’t just one person but rather an institutional problem. How comforting. Looking at the larger picture, Annabel Crabb points out that it surely doesn’t matter exactly how we pay for the rebuilding; whether the money comes from an extra tax or extra government debt. What matters – especially in the aftermath of Cyclone Yasi – is that the government has a plan. It doesn’t have to be the best plan, conforming to conventional political ideology – just a workable plan. A little bipartisanship wouldn’t hurt. Abbott himself tried (during the last election campaign) to draw a ludicrous distinction between a tax and a “temporary levy”. Abbott’s own “temporary levy” to fund his parental leave scheme would have raised more money than the Gillard’s flood levy ($2.7 billion originally compared to $1.8 billion), and so presumably had a larger impact on the economy. Despite the Coalition cynicism over the “temporary” nature of the flood levy, Gillard has at least flagged an end date (12 months), while Abbott’s proposed “temporary” parental leave levy was actually open-ended. The issue has briefly crossed political boundaries. It would be very, very easy for Colin Barnett to oppose the levy, considering WA’s innate conservatism and Abbott’s determined opposition, but instead he supports it, and on top of that also accepts the notion of reduced federal infrastructure spending. Meanwhile, Kristina Keneally wants special treatment for Sydney, which I think is little more than a parochial sense of entitlement, brought on perhaps by the looming inevitability of electoral annihilation. If we’re going to subject Sydneysiders to different income thresholds than exist elsewhere, then as a matter of consistency and fairness we should have a model that determines separate thresholds for every region in the country based on the cost of living. However, that starts to look a bit complicated (and presumably expensive to administer). Things are not so complicated for Tony Abbott, for whom the mission is to find problems rather than solutions. Burmese mobster reprimanded by psychiatric representatives of maverick pizza cult.